Who says mom has to have all of the creative fun with the kids? Dads can get in on the action as well. It is important for Dads to spend quality time with the kids as well. Here are some neat Father’s Day crafts for kids to do with their Dads for this special day. Once these crafts made, you can play these father’s day games. Each dad is unique and different. Below are some craft ideas to make with kids for Father’s Day that take into consideration their needs and personality. What dad wouldn’t love a paperweight created by his kids? This is the perfect craft for any businessman to have in his office as a daily reminder of how his kids feel about him. You could even make two of these crafts. You could make one rock say Dad and the other one say Rocks. You’d have a set of paperweights instead of just one. ►Make these father’s day craft ideas for toddlers. Simply take a piece of construction paper and decorate it nicely with markers or crayons after you fold it in half. On the inside of the card write down a chore that you will do for your dad. Be sure to include an expiration date for the coupon. Make this a chore you know your dad hates to do. As an added bonus, you could include multiple coupons for different chores around the house. I am sure your father will love this craft idea. Use a container that used to hold coffee. Plastic containers with plastic lids work best for this type of craft. Cover it with construction paper. Cut a slit in the cover. Be sure to write “Coins” or a dollar sign on the can so your dad knows what it is. Father’s Day should be a time when Dads get to spend time having fun with their kids. Father’s Day crafts are one great way to spend quality time together. Use the crafts listed in this article as a starting point for creative things to do with your dad. I’m sure you will be able to come up with more wonderful crafts to create with your dad. I have been looking for the instructions for the craft, Love you to the Moon and Back. I really want to do this with my grandbabies for their dad. Help!!! Where do I find it. which is barely visible through to damage caused by falling trees. to be sure to admit this. I love her ability for managing to get the detail in close up, then subtly blurring the background. This is cute, easy and affordable. Thanks for sharing! so much more. This month on December 9th, I met with you in Westchester, NY. What your ex boyfriend needs is some space for a while. These are some really fabulous ideas!!!! 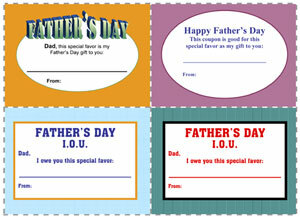 I have gotten my Husband’s Father Day cards, but still need to determine his gifts..so thank you so much for the ideas!